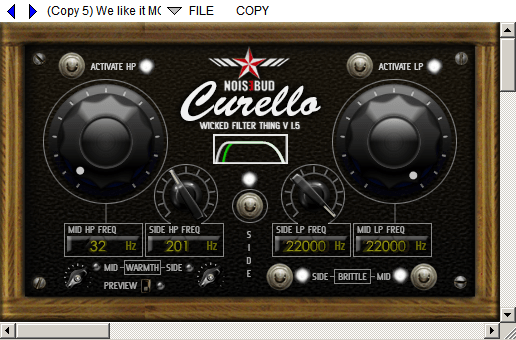 Curello is a mix and mastering tool to quickly filter out excessive low and hi-end for a tighter bass and correcting phase issues. One common approach to tighten up the low end and at the same time prepare the audio for both club plays and vinyl production is to put a HiPass filter on the side channel. This is often done in the mastering stage but the more aware producer or sound engineer might do it at the mix stage. Curello make that process as easy as sipping coffee. -“Hi all at NoiseBud, I’m a Mix\Master Engineer and I Usually need a Double filter HPF+LPF at 6\12\18 dB\Octave and Linear Phase at 0 latency but nobody even created some kind of VST, We could develope together!!! I’m glad to collaborate!!! I don’t think we’re the ones to create a Linear Phase filter with 0 latency and the idea of creating something that already exist didn’t felt so appealing at first (there’s hundreds of filter plugins out there). But… We where at the time experimenting with new filters for our plugin “Listen” so we compiled a plugin called Curello with the filters from Listen and sent it to Mr. Curello, just for funsies. We pretty soon realized that it wasn’t such a bad idea after all. Even if you can achieve the same things with numerous plugins on the market, both free and commercial, they’re all need some tweaking before you get what you want. So even if Curello pretty much did exactly the same thing it did it in a faster and more intuitive way. The Noisebud way, get where you want with as little hassle as possible, concentrate on the music and not the gear. Well, here we are, the second incarnation of Curello. Not exactly as Mr.Curello wanted it but with added functionality and we’ll add more as we go along. So; Thank you Mr.Curello for coming up with the idea! DOWNLOAD THE DEMO (version 1.0) – The GUI has a big ‘Demo’ mark and there’s a burst of white noise once in a while.